Over the course of the past year, we have frequently talked about the Dodge Challenger, the 840-horsepower Demon model, the 707-horsepower Widebody Hellcat and rumors about what else could be coming for the muscular Mopar coupe. We even got a teaser image last week showing the new dual scoop hood design of the 2019 Challenger, but we really haven’t had much to talk about with regard to the supercharged Charger. That all changed yesterday, when the first spy shots were captured showing what we assumed was a facelifted Hellcat Charger. Today, we know that yesterday’s spy shots were indeed the 2019 Hellcat, as Dodge has offered up the first images of the supercharged sedan coming for the new model year. 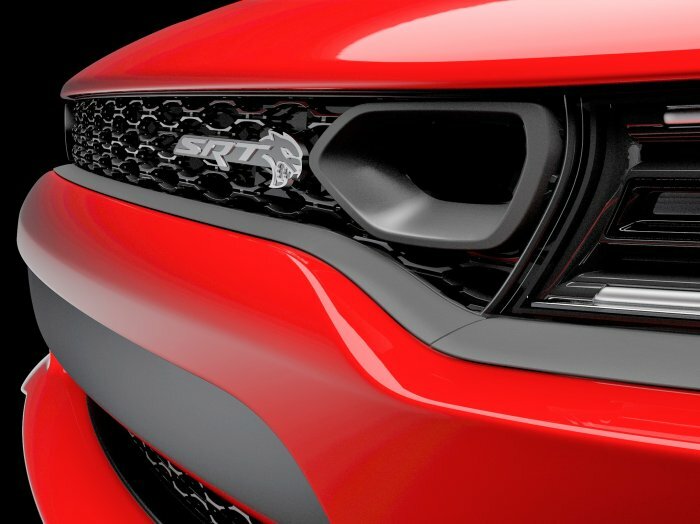 As you can see in the image above, the front end of the 2019 Dodge Charger SRT Hellcat looks like the 2015-2018 models, with the exception of a new air inlet port mounted next to the driver’s side headlight. Considering that the air intake system for the supercharged Hemi is behind the driver’s side headlight, it seems likely that this new air inlet is designed to provide more cool air to the monster engine. This could be a similar intake system to the one used on the Dodge Challenger SRT Hellcat, which draws air to the engine via the inlet located in the driver’s side headlight assembly. The Charger’s headlight design doesn’t allow for that pass-through design, so the engineers made due without it, but for the 2019 model year, the Hellcat-powered sedan will likely have a similar system that works with the new grille design.